Douglas Allen Blaney passed away at his home from complications of liver cancer on Monday, September 3, 2018 at age 64. He was born Wednesday, December 16, 1953 in Lusk, Wyoming and later adopted by Robert Lloyd and Bonna Jean (Monger) Blaney. He is survived by his wife, Darlene (Schroeder) Blaney; a daughter, Alyssa (John) Ledingham; a son Daniel (Mattie); three granddaughters Makayla, Katelyn, and Natalie Ledingham; his half-brother, David (Judy) Stallman; and his half-sister, Cindy Olsen. Doug grew up in Wyoming where his father, a mechanic for Continental Pipeline, worked in various places. He spent his early years in Horse Creek, Cheyenne, Glenrock and Lance Creek, Wyoming. He attended elementary and junior high school in Lance Creek, Wyoming, and graduated from Niobrara County High School in Lusk, Wyoming in 1972. In high school he played football, basketball, and participated on the rodeo team. He qualified for the National Finals High School Rodeo his senior year in team roping which enabled him to also compete in the tie-down roping. Following high school he took a one year course at the Technical School of the Rockies in Thermopolis, Wyoming where he received a certificate as a Veterinary Technician in 1973. In January 1974 he began his freshmen year at the University of Wyoming, graduating with B. S. in Animal Science in December of 1977. Doug married Darlene Schroeder on August 9, 1975 in Wheatland, Wyoming. After marriage, both continued their college education at the University of Wyoming. In 1978, they moved to Idaho Falls, Idaho where he worked for a farm implement dealer, selling farm equipment in Idaho and Montana. In 1979 the couple returned to Cheyenne, Wyoming, and in 1980 he moved to Carr, Colorado where he farmed and ranched. 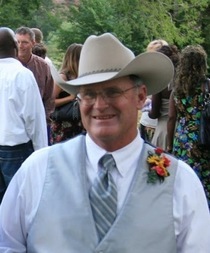 Doug enjoyed working with cattle, sheep and horses. He especially liked horses, and over the years he raised and trained several horses and also worked as a professional farrier. Doug was committed to his family, and always made sure to lend a helping hand to his children with 4-H, sports, and school activities. It was unusual for him to miss any game in which his children played, and he was always available to help with school and extracurricular activities. In his later years he stayed involved with his grandchildren, babysitting almost daily, and ensuring that rides to important activities were available. His love for children was overflowing. He could not walk past any baby or small child without stopping to talk to them and their parents. He combined his love of basketball with his love of children when he coached middle school basketball at Heritage Christian Academy and coached for the Fort Collins summer recreation league. For kids he was willing to go the extra mile, ensuring that latch-key children had a ride to and from practice. Doug was open and giving. Many will attest to his generosity and care throughout his life. Several nieces and nephews spent time with the family during their high school and college years. Doug was never too busy for anyone. Over the years he shuttled countless people to DIA (or Stapleton), took people camping and hunting, coached middle school basketball, served as chauffeur for family vacations, and ensured that his friends and family were well cared for. He was happy to lend a hand where ever it was needed. A memorial service is scheduled in the South Auditorium of Timberline Church, 2908 South Timberline Road, Fort Collins, Colorado 80525 at 11:00 am on Friday, September 7, 2018. Pastor Charles Williams of Loveland Bible Church will officiate. A funeral luncheon will follow in the East Auditorium of Timberline Church. Graveside services will be held at 4:30 pm the same day at the Wheatland Cemetery in Wheatland, Wyoming. In lieu of flowers the family requests that donations be made to Royal Family Kids, 3000 West MacArthur Boulevard, Suite 412, Santa Ana, California 92704, (714) 438-2494. On their web-site (www.rfk.org) you may choose to donate to the national organization or find a local affiliate near you.